Happy Fourth of July my gorgeous beautiful followers!!! 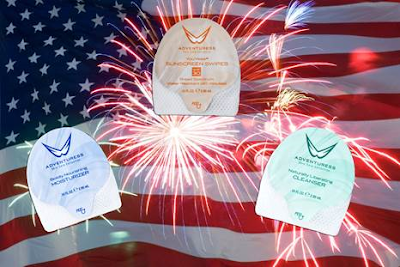 I hope you all have a safe happy Fourth, be safe and careful but also have lots of fun! As an early surprise gift, I teamed up with Adventuress Skincare to Give my of my lucky readers a Skincare Duo perfect for when you're going of out of town, perfect for traveling, (it is a deluxe travel set) or even at home. “All in one” convenience, for ALL your skincare needs! The Weekender is a great way to try several of our most popular products before you buy them individually. The sturdy, “go anywhere” tin contains 3 swipes of Naturally Liberating Cleanser, 3 swipes of Boldly Nourishing Moisturizer, and 3 YouVee’s SPF 30 Sunscreen Swipes. " 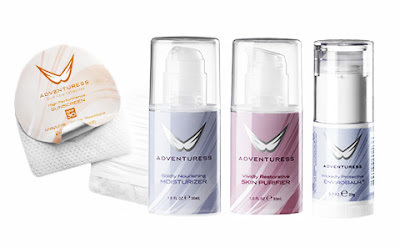 Purchase individual products, refill the travel tin and you’re off on your next adventure! Naturally Liberating Cleanser is one of the gentlest ways to cleanse your skin; great for clearing up acne, dirt or just to give your skin a quick, revitalizing wash.
YouVee’s SPF 30 Sunscreen Swipe has an ingenious sealed finger pocket for a clean application; no more greasy hands or fingers. For all skin types, including sensitive or Rosacea-prone skin.